Most people know that Retinol creams help to fight signs of aging, however many are not aware that retinol is a powerful medicine to help fight acne. Retinol or, in other words, Vitamin A is not only a powerful anti-oxidant that promotes healthy skin but it also helps to remove old skin cells, allowing new skin cells to shine through. In addition, vitamin A has both anti-bacterial and anti-inflammatory properties than can reduce the frequency of breakouts and when breakouts occur to reduce redness and inflammation. The best Retinol cream for acne is any retinol cream that contains an adequate amount of retinol together with some other quality moisturizing ingredients that will not dry out or irritate your skin. Sometimes, a retinol cream that works great for one person may not be equally good for another. 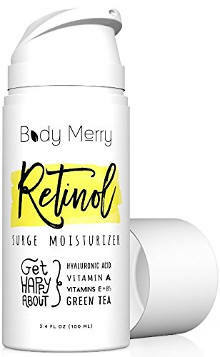 So, this review offers a look at some different options we have selected based in their combination of retinol with quality natural and organic ingredients as well as good user reviews. InstaNatural is a reputable company creating quality and effective natural and organic skin care products which people seem to be greatly pleased with. 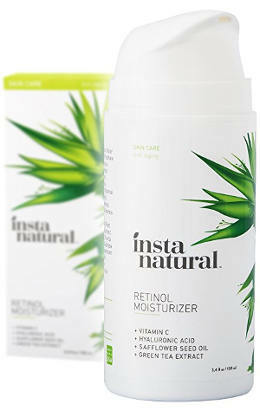 InstaNatural Retinol Moisturizer combines a 2,5% of Retinol together with some top anti aging and moisturizing ingredients such as botanical hyaluronic acid, vitamins C, B5 and E as well as organic aloe vera, jojoba oil, shea butter and green tea. This moisturizer is very good for anti aging, restoring and moisturizing purposes but it also works fine to control breakouts and reduce blemishes, even skin tone and reverse the damage of the Sun. Recommended for both women and men. Free of fillers, alcohol, sulfates and parabens. Organic Aloe Vera, Organic Sunflower Oil, Retinol, Palm Oil, Glyceryl Stearate, Cetyl Alcohol, Stearic Acid, Vitamin C (Sodium Ascorbyl Phosphate), Botanical Hyaluronic Acid, Organic Jojoba Oil, Kosher Vegetable Glycerin, Shea Butter, Wildcrafted GreenTea, Wildcrafted Propolis, Vitamin E (d-Alpha Tocopheryl Acetate), Vitamin B5 Panthenol), Phenoxyethanol, Ethylhexyl Glycerin, Xanthan Gum, Citric Acid. 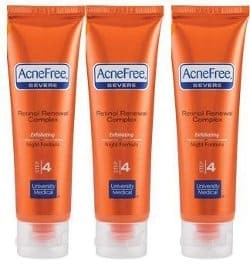 Reduces acne redness– Users find that using this cream when they do have an acne breakout helps to reduce the redness from the acne. Unclogs pores– They immediately notice that it tends to unclog their pores removing oil and blackheads. Prevents blemishes– With a combination of ingredients that are both anti bacterial and anti inflammatory, this products is able to prevent blemishes. No irritation– While retinol can result in irritation to some people, users of this cream did not report any such side effect. Organic Aloe Vera, Organic Sunflower Oil, Palm Oil, Pentylene Glycol, Phospholipids, Retinol, Polysorbate 20, Potassium Phosphate, Tocopheryl (Vitamin E), Plant Derived Hyaluronic Acid, Glyceryl Stearate, Cetyl Alcohol, Stearic Acid, Kosher Vegetable Glycerin, Organic Jojoba Oil, Wildcrafted Green Tea, Wildcrafted Propolis, Shea Butter, Panthenol (Vitamin B5), Phenoxyethanol, Ethylhexyl Glycerin, Xanthan Gum, Citric Acid. Reduces Breakout Occurrences– Most people who have suffered from acne said that this product reduces how often their breakouts occur. Helps Minimize Acne Scars– They also notice that after several weeks of use, it reduces the appearance of old acne scars resulting in a smoother and more even looking skin tone. 3- 1 ounce tubes of cream. According to the company, it is less irritating than typical retinols. Water/Aqua/Eau, Caprylic/Capric Triglycerides, Glycerin, Glyceryl Stearate, PEG-100 Stearate, Ethyl Macadamiate, Cetearyl, Ceteareth-20, Dimethicone, Dimethicone/Vinyl Dimethicone Crosspolymer, Retinol, Allantoin, Sea Whip Extract, Sodium Hyaluronate, Bisabolol, Zingiber Officinale (Ginger) Root Extract, Xanthan Gum, Cetyl Alcohol, Polysorbate-20, Cetyl Palmitate, Ceramide-3, Allyl Methacrylates Crosspolymer, Polysorbate 20, Disodium EDTA, Triethanolamine, Phenoxyethanol, Ethylhexylglycerin, Methylisothiazolinone. There are some controversial ingredients in this formula such as PEG-100 Stereate, thriethanolamine and even phenoxyethanol for sensitive skin. 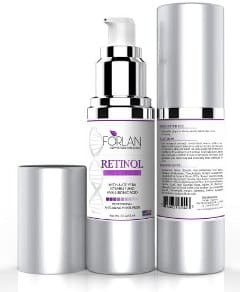 Fades Acne Scars– Most users noted that this retinol product helps to reduce the appearance of acne scars leaving their skin looking smoother and healthier. Reduces Breakouts– They also feel that it minimizes the frequency of breakouts. Contains vitamins A, B5, C and E.
Deionized Water, Glycerin, Aloe Barbadensis Leaf Juice, Sodium Hyaluronate (Hyaluronic Acid), Phospholipids, Retinol (vitamin A), Leuconostoc/Radish Root Ferment Filtrate, EDTA, Glyceryl Stearate Citrate, Sunflower Oil, Cetearyl Alcohol, Shea Butter, Hydrogenated Ethyl Hexyl Olivate, Hydrogenated Olive Oil Unsaponifiables, Stearic Acid, Rose Essential Water, Jojoba Oil, Phenoxyethanol, Caprylyl Glycol, Sorbic Acid, Xanthan Gum, Pentylene Glycol, Tocopherol Acetate (vitamin E), Panthenol (vitamin B5), Sodium Ascorbyl Phosphate (vitamin C), Sodium Hydroxide. Cleans Pores– Users say that this vitamin A moisturizer cleans out pores leaving their face feeling and looking cleaner. Reduces Acne– Most of them find that it helps to reduce acne breakouts. Fades Acne scars– Continual use minimizes the appearance of old acne scars leaving the skin looking smoother and healthier. In conclusion, the best retinol cream for acne is the one that has safe natural and organic ingredients but it is also effective enough to provide you with visible results. Still, don’t rush into conclusions if you have not given enough time to your retinol product to work on your skin.